Thomas Campbell on mental health and volunteering in Sri Lanka. As a graduate aiming for a career in clinical psychology, my search for relevant experience has taken me far and wide. From working as an Autism Support Worker, to entering data for a counselling charity, to completing a person-centred listening course, I’ve been getting familiar with the mental health field in the UK for a couple of years. My latest venture plunged me into a foreign culture in the developing world and exposed me to a diverse range of professionals and clients as I joined SLV on their Graduate Mental Health Volunteer Placement in Sri Lanka. 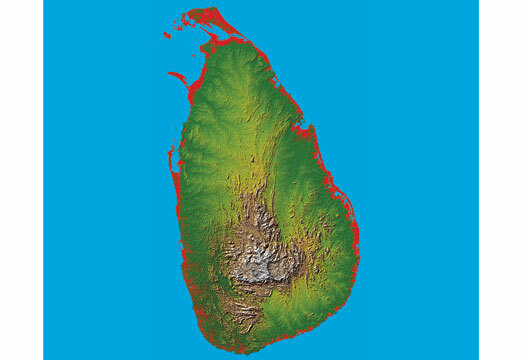 Prior to this placement I was largely aware of Sri Lanka in relation to two major tragedies in recent history: the bloody civil war between the Sri Lankan government and Tamil separatists, ending in 2009 after 26 years; and the 2004 Indian Ocean tsunami which killed around 35,000 and displaced more than 800,000 Sri Lankans. Whilst I, of course, knew that there would be far more to this island nation of 20 million inhabitants than the sorrow and misery of these two events, I did expect that my volunteering experience would be largely coloured by their repercussions. What I encountered was a diverse range of people and situations that were not limited to the trauma of war and disaster. I expected the challenges posed to mental health in this developing nation to differ from those in the UK but found that the most prominent issues were, in fact, similar. Yes, the scale of the challenge here was certainly magnified, but in general the issues of stigma, lack of understanding and an extreme lack of funding, resources and care-availability were the main barriers to improving mental health. Stigma around mental illness is a global challenge and has been described as the main obstacle to provision of care for people with mental illness. Sri Lanka is no different, and countless professionals. I spoke to identified stigma as a major problem in society. Religious and cultural beliefs permeate public attitudes, and the concept of karma – that there is a causal relationship between someone’s present circumstances and their actions in a previous life – seems to justify blaming victims for their mental illness. Yet contrary to my expectations, more rural communities in which traditional beliefs were strongest actually appeared to display more acceptance of their mentally ill than industrialised communities. In an urban suburb I saw a culture of abandonment on a weekly basis at the psychiatric institute and rehabilitation centres we worked in. Owing to some archaic legislation the female patients here can only be discharged by the family member who signed them in. Often these family members are not easily traced and so societal reintegration following admittance is generally low, prompting one psychiatrist I spoke with to quip: ‘Half Way Home is a misnomer; it’s Forever Home.’ Indeed, whilst we were working there, the institute was officially full. Despite this, over one third of the patients leave the facility to work each day, returning in the evening, and with no intensive security there is not a feeling of detainment, only one of hopelessness. Contrast this with the support and acceptance I witnessed on a field trip to a psychiatric outreach clinic in the rural north. Here it seemed that the traditional family unit was stronger than in urban centres where life has taken on a more Westernised, individualistic flavour. Whereas those in cities seemed excluded from the fast-paced lifestyle, the rural mentally ill enjoyed greater social integration. Many had been medicated for years, but maintained their roles as farmers, shepherds and mechanics. It seemed the simple, manual nature of their work had some remedial quality that allowed them to maintain their routines in spite of their conditions. This seems to chime with Waxler’s findings some 40 years ago, of better reintegration for the mentally ill in non-industrialised Sri Lanka. This urban–rural dichotomy suggests, perhaps, something inherent in Western industrial culture that is geared towards exclusion of the mentally ill.
Another common issue was a lack of awareness and understanding around the concept of mental health, and of what support is available. Again, related to traditional beliefs, people would often attribute a person’s poor mental health to a vengeful god or possession by a spirit. In one outreach clinic a war victim who had lost his sight in an explosion presented with panic attacks and vivid, intrusive memories. This was his first contact with any mental health service, a full seven years after the war had finished. It seemed that, after trying traditional healing to no avail, he was visiting the clinic as a last resort. The psychiatrist, a minority in his staunch atheism, let us know in no uncertain terms his feelings about the traditional religious healers who often charge high rates for their rituals: ‘They prey on vulnerable, simple people and their practice stands in the way of science.’ Yet he recognised the need to meet people on their level, and to be sensitive to their personal convictions whilst encouraging them to use the service he provided. Mental health care is highly underfunded in Sri Lanka with approximately one psychiatrist per 500,000 inhabitants and, according to one counselling service, zero psychologists outside of Colombo. Needless to say, the medical model is dominant and yet still falling short of demand. We witnessed the noble efforts of the psychiatrist in the north and his outreach clinics: bringing care to the people. But in general, without motivated and exceptional professionals like him, the isolation of many communities means the impracticality of travelling into a town with a hospital makes it highly unlikely that they will: with poor roads and irregular buses, travelling even 50km to reach a hospital can take all day. One organisation we worked with was Samutthana, a psychological service set up by King’s College London whose focus is on ‘supporting the development of more holistic and less medicalised services that promote recovery, and that people can access in the community’. Their team of trained psychologists and counsellors provide therapies such as CBT, eye movement desensitisation and reprocessing, and narrative therapy. Their efforts span the entire country, but they are a small organisation and represent a rare example of good mental health care. One counsellor from Samutthana admitted that any type of psychotherapy outside Colombo is extremely unusual and that, within the city, it is only really available to privately paying clients. It seems that most people’s options are limited to pharma-psychotherapy. That’s a shame because, according to Samutthana, therapies such as CBT lend themselves quite easily to Sri Lankan culture. The Buddhist view that ‘we are what we think’ works well with CBT’s emphasis on adjusting thought patterns. There are issues with converting Western-developed therapies such as CBT from English to Sinhala, with some of the psychological language and concepts not translating smoothly, but, it appears, with a creative, flexible practitioner, psychotherapies such as CBT could represent a viable alternative to medication. One of my biggest concerns was whether the work I did would make any difference or merely serve as token ‘experience’ for my CV. I expected that a major limiting factor here would be the language barrier. Whilst SLV’s staff comprises 90 per cent Sri Lankan nationals, they are generally there to coordinate logistics and not to interpret attempted interventions. Perhaps my attempts to support patients in introspection and emotional expression were over-ambitious. I would privately despair when my ‘emotions wheel’, complete with painstakingly transcribed English to Sinhala instructions, became yet another colouring template, or when our planned drama session to encourage ‘perspective taking’ at a boys detention centre descended into a free-for-all. At times I questioned the point of it all. Doing arts and crafts, or leading a stretching routine, seemed somewhat shallow and redundant when patients were suffering from chronic depression or schizophrenia. However, I came to realise that the ‘point of it all’ is that we are dealing with fellow human beings, and that we can make connections and share experiences that transcend spoken-language barriers. Of course we are not going to cure schizophrenia by throwing a ball around, but by going in with warmth, empathy and acceptance – core conditions that are essential to any therapeutic alliance – we can create the right environment to have fundamental human experiences such as sharing a laugh, a smile or simply a quiet moment sitting together. I don’t know the reality of living in an institution in Sri Lanka, but I can see that it is not a fulfilling existence. Volunteers coming in with enthusiasm and energy may go some way to brightening the otherwise colourless week for these patients. From the feedback we received via nurses and psychiatrists, the patients loved the sessions run by the ‘white people’ and looked forward to those few hours where people tried to connect with them as humans. I also had initial concerns about ‘voluntourism’. There is a whole industry composed of organisations offering short-term breaks combining exotic travel and a minor volunteering role. In theory these represent a win–win situation: contributing to local communities; personal development and experience for volunteers. However, there have been many flaws highlighted in this type of enterprise, such as unethical ‘for-profit operators’; skills-gap between volunteers and community needs; and importing neo-colonial attitudes. SLV seem to address these issues well. Volunteers are selected on the basis of their background skills and experience (only one in six applicants are selected, according to their statistics) and their respect for local culture was stringent. Furthermore, at between one and three months, SLV’s placements are longer than most voluntourism organisations’ one- to two-week placements, which reinforces the continuity and consistency of the support they offer to communities. Different batches of volunteers come and go, but the projects run year-round, and with each new batch comes a replenished source of ideas and enthusiasm. I gained both an interesting insight into mental health in a foreign culture, and the opportunity to develop my personal skills and qualities. Being challenged to provide support for vulnerable people with language barriers has broadened my understanding of basic human connection. SLV provided a reasonable platform for volunteers to make a difference here, both for themselves and for the communities they work with. Beyond this it is up to the individual to put in the effort to learn from, and reflect on, the situation they are in. Despite being separated by over 5000 miles, cultural differences and a socio-economic chasm, the challenges facing mental health are similar between Sri Lanka and the UK. Stigma, awareness and availability. Motivated, dedicated people who have the skills and personal qualities necessary to make a range of mental health interventions widely available. I hope that through this experience I have taken some valuable steps on my journey towards being one of those people.